Ben Clements, University of Leicester. The British Election Study (BES) 2009/10 is available online for wider usage. The BES has covered every general election, and thus gauged the political choices and attitudes of nationally-representative samples of the British electorate, since 1964. More information on both the current and previous studies is available at: http://www.bes2009-10.org/. Clarke, H. D. et al. (2004), Political Choice in Britain. Oxford: Oxford University Press. Clarke, H. D. et al. (2009), Performance Politics and the British Voter. Cambridge: Cambridge University Press. The components parts of the BES 2009/10 have involved both a multi-wave internet panel survey (pre-, during and –post-campaign waves) and a more traditional face-to-face component (itself comprising campaign and post-campaign surveys). This note reports a range of political attitudes held by the British electorate at the most recent general election broken down by religious affiliation (all data are appropriately weighted). Specifically, religious affiliation is divided into five broad categories to assist with clarity of presentation: Church of England/Anglican, Roman Catholic, other Christian denomination, other religious affiliation (note that this is a ‘catch-all’ including, for example, non-denominational Christians), and no religious affiliation. A more detailed set of categories was used to record a fuller range of religious affiliations in the BES survey process. As well as reporting whether these groups voted at the election, and, if they did vote, their party choice, data is also provided regarding views on who would make the best Prime Minister, their attitudes towards the main parties and their leaders, and – pertinent to the current political landscape – their views on coalition government and satisfaction with democracy. The data provided here is taken from the pre-campaign and post-campaign waves of the internet panel survey, which has a very large sample size. Religious affiliation was measured on the pre-campaign wave and the political attitudes, including vote choice, are taken from the post-campaign wave. Respondents are asked about party preferences on earlier waves but this involves recording their vote intention, which could change during the course of an unfolding election campaign – potentially right up until polling day! It is important to bear in mind that the BES sample traditionally has a higher level of turnout at each general election than the actual level in wider electorate (about 65 per cent for May’s general election). This is clearly reflected in the high proportions, across all categories, saying they voted at the General Election in May (see Table 1). Anglicans and those from other Christian denominations were slightly more likely to have voted than Roman Catholics, those from other religions, and those with no religious allegiance. More generally, those who are willing to participate in social and electoral survey research are more likely to have higher levels of awareness of and participation in the political process, i.e. turning out to vote at local and national elections. The next table (Table 2) shows the breakdown of vote choice across major and minor parties by religious affiliation. There are some clear differences in voting behaviour. Anglicans, partly reflecting the old characterisation of the Church of England as the ‘Conservative Party at Prayer’, were most likely to vote for the Tories – 45 per cent compared to a quarter voting Labour and a fifth voting for the Liberal Democrats. Roman Catholics, traditionally a strong electoral heartland for Labour, were most likely to have voted for New Labour. Around two-fifths voted for Labour, about 30 per cent supported the Conservatives and less than a quarter – 23 per cent – cast their ballot for the Liberal Democrats. The vote of those belonging to other Christian denominations was more evenly spread across the three main parties: Labour – around 30 per cent, Conservatives – around 33 per cent; Liberal Democrats – 26 per cent. The Liberal Democrats picked up more support from those belonging to other religious groups (around 31 per cent) and those reporting no religious affiliation (about 33 per cent). Labour received similar levels of support from these two groups (around 28 per cent), while the Conservatives received around 31 per cent of the votes of those belonging to other religious groups and around 29 per cent of those with no religious affiliation. Using BES data allows us to move beyond voting participation and party choice and look more widely at views of the parties and their leaders. Those surveyed were asked who of the main party leaders they thought would make the best Prime Minister (see Table 3). 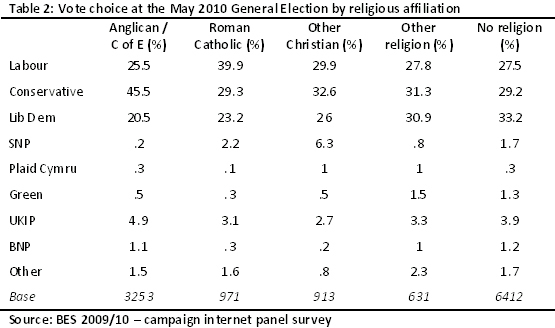 David Cameron was most popular amongst four of the five groups: Anglicans (half of this group rated him most highly), other Christian denominations, other religious groups, and those with no affiliation. Gordon Brown was rated most highly by Roman Catholics, though he was closely followed by Cameron (around 36 and 33 per cent, respectively). In contrast, Nick Clegg was not rated most highly by any group but did best amongst those belonging to other religious groups and those with no religious affiliation (19 and 20 per cent, respectively). Also worth noting are the small but significant minorities who respond ‘don’t know’ to this question (ranging from 16 to 24 per cent across the categories), despite the centrality of the main party leaders to the parties’ general election campaign and in the attendant media coverage, with the notable addition this time round of three leadership debates broadcast in prime-time slots. As well as judging the leader most capable of being PM, the British electorate also form more general impressions as to whether they like or dislike a particular party or leader. The BES gauges these views by asking respondents to rate how much they like (or dislike) a party or leader by scoring them on a scale from 0 to 10. Two tables show the average scores (by religious affiliation) for the three main parties and their leaders, respectively (Tables 4 and 5). Labour is liked most by Roman Catholics and other Christians; it is least liked by Anglicans. The Conservative Party gets its highest rating from Anglicans and receives its lowest from those with no religion. The Liberal Democrats receive the highest scores for likeability across all groups except one – Anglicans (and even here they are pretty close to the Conservatives). Their highest score is awarded by those with no religion, closely followed by other Christians. In terms of the leaders, as we might expect from the previous evidence David Cameron is most liked among Anglicans and least liked by those with no religious affiliation. Gordon Brown is liked most by Roman Catholics and other Christians and least liked by Anglicans (receiving the lowest score of any category). What is striking is that Nick Clegg is rated most likeable across all the five categories, consistently getting scores over 5, but that does not equate to high proportions thinking he would be the best or most capable Prime Minister. Clearly, then, the Liberal Democrats and their leader do relatively well on the likeability factor across the board. Particularly pertinent given the political circumstances which have unfolded since the election outcome, we can look at attitudes towards government formation (Table 6). BES respondents were asked whether they preferred single-party government (the norm in post-war British politics) or a coalition administration comprising two or more parties. Across all categories there was majority support for the traditional way of doing business at Westminster – governments formed by a single party. Support was strongest amongst Anglicans and Roman Catholics. The largest minorities in support of coalition administrations were found amongst those belonging to religions other than the main Christian denominations, and those with no religion. In each case a small minority responded “don’t know” – the proportions offering this response to questions of this sort may well decrease as views evolve and crystallise on the performance of the current Conservative-Liberal Democrat administration. Taking a broader view, we can also see how these groups evaluate how the system of democracy currently works (Table 7). Specifically, they are asked their degree of (dis)satisfaction with British democracy. Across the board, respondents are more likely have a clear opinion on this question – very small proportions (6 per cent or less in each case) can’t choose either way. Those most likely to be ‘very’ or ‘a little’ dissatisfied with democracy are those with no religion – around a half of this category offer either of these responses. Those most satisfied, either ‘very’ or ‘fairly’ are other Christians (at 57 per cent) followed by Anglicans (53 per cent) and Roman Catholics (53 per cent). Ben Clements is Lecturer in Politics at the University of Leicester, with interests in the study of elections, public attitudes to the EU, and the work experiences of the visually-impaired. He is author of Religion and Public Opinion in Britain (Palgrave Macmillan, 2015). He can be contacted at bc101@leicester.ac.uk.